Just for fun, here's the striking album art for Meco Monardo's 1980 album, Music From Star Trek/Music From The Black Hole - his attempt to recapture the success that his Star Wars and Other Galactic Funk album had a few years before. 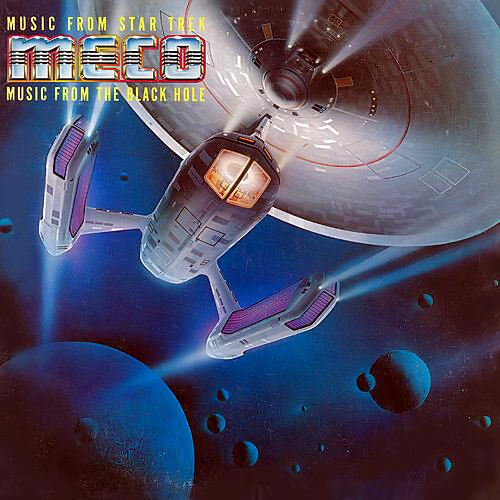 Unfortunately, the Jerry Goldsmith and John Barry scores for these films didn't quite lend themselves to disco-ization quite as easily as John Williams' sweeping Star Wars music - though, to be honest, I do rather enjoy Meco's "Star Trek Medley." "Stand by for warp drive in ten seconds..."
I once made a Star Trek fan cry by playing that for him. He considered it sacrilege, though I quite like it myself. Geoff Love and his Orchestra also put out a space themed disco/lounge album (lots of people did), Star Wars and other Space Themes, that has a fascinating cover, sort of a mash up of all the movies its taken from. The album cover's definitely-not-a-Constitution-Class starship is pretty cool looking. I didn't even recognize the Black Hole soundtrack in the disco version! On another note, I've been looking for the Barry score for quite some time, but can't find one that isn't outrageously expensive. It really is gorgeous stuff. Talk about an underappreciated classic - I bought my copy of Barry's soundtrack (on vinyl) circa 1982, for $.99 in the cut-out bin at Thrifty Drug. I´ve still got that record: "What would you do, if you had to save the Earth from something attacking you?". "You'd send the best man you had - doodad doodad doodad!" Hey, as long as we're talking about Meco's STAR WARS medley (we were, weren't we?) I can easily imagine John Barry's STARCRASH theme given the same exotic arrangement as Princess Leia's theme in the SW medley. The full remastered soundtracks to The Black Hole and Star Trek The Motion Picture have finally been released on CD! STTMP is available in a limited edition 3 CD set from La La Land. TBH was released by INTRADA. Both are fantastic and well worth the money. Also, I found a Russian 'legal' bootleg CD of the Meco album on Ebay several years ago. Although it's obviously ripped from vinyl, it still sounds pretty good.